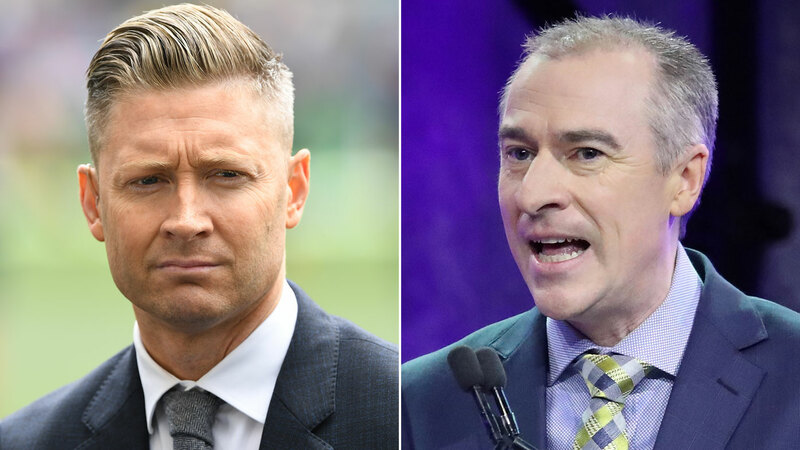 Former Australian captain Michael Clarke has issued a furious response to a radio blast from top sports broadcaster Gerard Whateley. On his SEN Radio show, Whateley attacked comments from Clarke about a toning down of aggression in Australian cricket. Clarke, speaking on Macquarie Sports Radio, argued that "we won't win s***" without a hyper-competitive approach to the game. Whateley said Clarke's comments "might be the single greatest piece of nonsense over the past nine months" (since the Cape Town ball tampering scandal) and claimed that a part of Clarke's legacy was Australia being regarded as "the most despised team in world cricket". Clarke issued the following response to Whateley and SEN, addressed to "Gerald Wheatley", calling the broadcaster "a headline chasing coward". "In cricketing terms, Michael Clarke is proving himself the last of the great climate deniers. "When the cultural review identified the phenomenon of the gilded bubble where elite cricketers existed in a parallel universe blessed with wealth and privilege oblivious to outside perception and influence, it should’ve posted a photo of the former captain. "Clarke’s interpretation of the predicament the Australian men’s Test team finds itself in is breathtaking. That he would continue to rely on 'the line' – the fiction his and subsequent teams used to excuse all manner of boorish behavior – might be the single greatest piece of nonsense over the past nine months. "Australia didn’t know what or where the line was - that’s how it ended up with sandpaper on the field. "Tim Paine’s Australia isn’t trying to be the most liked team in world cricket. "It is very specifically trying to no longer be the most despised team in world cricket, a scourge that is part of Clarke’s legacy. "It’s why the Test team ranks last in the research measuring the emotional connection of Australian sports fans to its teams. "The Test summer before us is a critical moment of recalibration and Paine and his team who are left with the tremendous responsibility of restoring the national cricketing character deserve better than what Clarke is espousing. "To hear it, to read it just made me angry."